Over 3,000 years ago, in the warm, fertile lands that are now Mexico, Belize, and Guatemala, the great Maya civilization arose — its vast pyramid temples appearing to come out of nowhere. But new evidence suggests a fascinating origin for this ancient, advanced culture. Just as the Inca once dominated South America, the Maya dominated large parts of Central America and Mexico. But we know far less about Maya civilization. Now, after seven years of careful excavation at the famous Maya cultural center of Ceibal in Guatemala, University of Arizona anthropologists Daniela Triadan and Takeshi Inomata believe they have settled one of the greatest debates in their field: where the Maya came from. They published their work today in Science. For almost half a century, anthropologists studying the origins of the Maya have been divided into two camps. Some believe that the Maya civilization developed in Guatemala and Belize, without any contact from other groups in the region. But others believed the Maya were an outgrowth of the advanced Olmec civilization on the Gulf Coast. In 1300 BCE, the Olmec had erected an impressive city at what is now San Lorenzo, complete with massive ceremonial architecture featuring now-famous carvings of human heads. The question of the Olmec's influence hinged in part on decades-old evidence that the Olmec center of La Venta, also on the Gulf Coast (see map below), was the first highly-advanced city to have Maya-esque architecture, including pyramids. 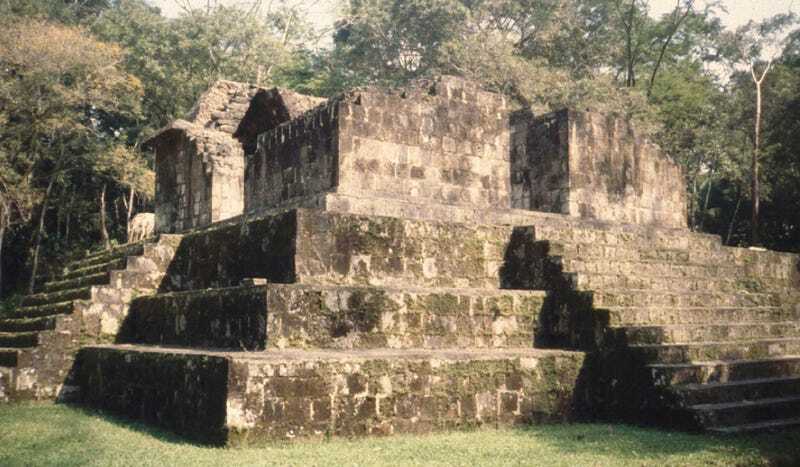 Because La Venta had clearly been built after the Olmec city of San Lorenzo, probably starting in 800 BCE, it made sense that the Maya engineers had followed in the Olmec's footsteps. The idea was that the characteristic Maya city layout developed between the construction of San Lorenzo and La Venta. La Venta's location also made it seem that Maya culture came from the Olmec, then spread from the Gulf Coast southward into Guatemala and Belize. But now Inomata and Triadan and their colleagues have solid evidence that La Venta was not the oldest city with Maya features. In fact, their team conducted extensive carbon dating at the Guatemala site of Ceibal, and placed its origins at least two hundred years before La Venta. Ceibal has all the characteristics of a typical Maya settlement, with an enormous pyramid at one end of a large central plaza dominated by a ceremonial platform. And it was founded in about 1,000 BCE. What this means, according to Inomata and Triadan, is that something a lot more complicated happened than either of the previous two scenarios would allow. The Olmec did not "create" the Maya culture, nor did it evolve by itself in Guatemala. Most likely, it was the product of a very rapid social transformation that was taking place all over the region — caused, in part, by cultural exchanges between different groups, including the Olmec and the peoples who eventually became the Maya. This chronology indicates that there was a gap between the decline of San Lorenzo and the rise of La Venta. Major social change occurred during this gap. Various groups in southern Mesoamerica began to experiment with new forms of religion and social organization. This resulted in the emergence of formal ceremonial complexes with pyramids at various settlements. San Lorenzo did not have pyramids or similar spatial patterns. Ceibal was part of this transformation. What's fascinating about what Inomata calls "this gap" is that it represented a dramatic — and still mysterious — acceleration of the era's most advanced technologies. Those technologies included civil engineering and agriculture. Over the course of just a few short centuries, the primarily nomadic hunter-gatherer peoples of Guatemala transformed into city dwellers with vast farms. A huge network of roads connected their villages and cities. And at Ceibal, the excavation team was able to see that transformation unfolding in the many layers of human habitation that had been built on top of each other. Also, the cultural transformation had been underway before the founding of Ceibal. According to anthropologist Triadan, people who settled there already had a clear idea of how to build what we would now call a classic Maya community. So the cultural shift towards a Maya view of the world was probably already taking hold throughout Central America. The actual space where people lived and celebrated rituals seemed to be extremely important, because they kept constructing new buildings over the original ones, now using clay in their constructions. By 800 BCE the western building . . . became a pyramid and the platform to the south of it reached a monumental scale. No monumental constructions of this date have been found at other Maya sites. The first people who settled at Ceibal had already a well-developed idea about what a village should look like. It included a planned ritual complex and other building projects that required the participation of the whole community. Some people might already have had a special position in the community and there were most certainly people with specialized ritual knowledge. This indicates that the transition from a mobile hunter-gather and horticultural lifestyle to permanently settled agriculturalists was rapid. Below, you can see a cutaway view of the layers of the city (click to enlarge). You can also see how far down the scientists had to dig over seven years to see the bottom layers. Below, here's one of the dig sites on the central platform (called the A-24 platform above). But what could have caused this rapid cultural transformation, which led so many people to start building pyramids and participating in what eventually became the Maya way of life? Triadan and Inomata believe that Ceibal, and other Maya villages like it, were the result of cultural mixing. The rapid pace of social change was spurred by many peoples sharing new technologies with each other, as well as new ideas. Social norms fell away and new rituals took their places. It would have been an extremely exciting time in history, when nobody was sure which cultures would come to dominate the area nor which ideas would take hold. Ceibal was settled for 2,000 years, and became a Maya center. But when it was founded, the Maya as such didn't exist yet. The Maya were creating themselves, forging a new identity out of many different groups — some with highly advanced technology, like the Olmec, and others nomads with nothing more than what they carried on their backs. What Triadan, Inomata and their colleagues' new discoveries suggest is that great civilizations don't grow out of previous dominant groups like the Olmec, nor do they arise in isolation. They are the result of hybridization. The Maya came to dominate Mexico, Guatemala and Belize because they were able to incorporate the innovations of the Olmec along with the discoveries and beliefs of many peoples in the area whose lives we are just now beginning to learn about. The ancient Maya were, in other words, a multiculture. We still aren't certain what lead to the downfall of the Maya — though there are some good leads — but now we have a better picture of where they came from. What really destroyed the Maya civilization? Read the full scientific paper at Science.